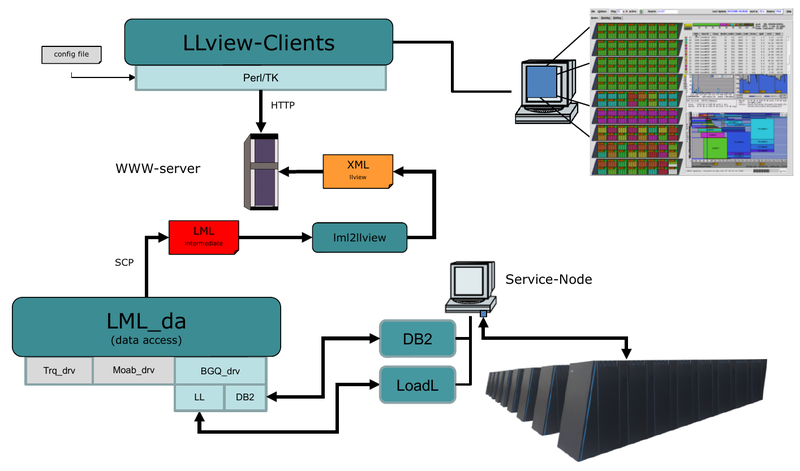 LLview is a client-server based application. The client LLview is the graphical user interface which displays the utilization of a batch system controlled cluster. The server application called LML_da is run on the login node of the target system. It triggers batch system commands and parses their output in order to generate an XML file containing a snapshot of the current system status. This XML file is transferred to the LLview client, which interprets and renders the status data. Depending on the target system different adapter scripts are used to parse the output of the batch system commands. There is already support for Grid Engine, Loadleveler, LSF, Moab, PBS, TORQUE and SLURM. Each of these adapters reads outputs from batch system commands and derives an LML file from the combination of job and node status data. The gathered information of the parallel system is converted into the Large-scale system Markup Language (LML), which defines the structure for XML files describing the current status of a supercomputer. LML functions as interface between LML_da and the client application. As a result, both components are independent from each other, which simplifies their extension and improves modularity. The main part of the LLview client is the node display. It shows a small box for each processor of an SMP node. The box color codes the job running on this processor. Furthermore, the node display contains additional elements displaying global information about each node such as status, memory usage and cpu load. When moving the mouse pointer over a processor box, the corresponding information is highlighted in the other display elements of LLview. These elements are job list, usage bar, information panel, three-day history view, scheduling prediction and a utilization chart. The server application is composed by a set of independent modules working on LML. Each target system adapter calls the particular batch system commands for retrieving currently running and submitted jobs as well as the states for the compute resources. E.g. on a TORQUE system the qstat command is executed and parsed for job status data. For node data pbsnodes is triggered. The data is converted into the uniform format LML, which is further processed in subsequent modular steps. There is a module for merging multiple LML files (for instance one job data and one node data file), a module for adding unique colors to each job, a schedule prediction module and a history manager. In earlier version of LLview an implicitly defined XML format was used for the data transfer. The LLview client is still working on that data format, so that the additional module lml2llview is necessary in order to translate LML data back to the old data format. There are three different modes in which LLview can access the data. In every case the data will be generated by the server program LML_da. The client part of LLview can access the data directly if the client runs on the same machine or LLview is configured to use a ssh-connection to the remote machine. In this mode LLview executes the LML_da workflow at every update step triggered by each client separately. The usual way is to distribute the data via a web server to support clients running on local desktops. In this case, LLview accesses the data from the web server with a user/password authentication method. The XML file on the web server is updated in a regular interval. Additionally, LLview provides a mechanism to record data and replay recent usage statistics. Therefore LLview is able to read a tar file which contains the XML files. LLview can also read flat XML files from a directory. The different modes for data access can be selected in the Option panel of LLview (see Managing Configuration Options). The currently used data access mode will be displayed in the status bar of LLview (see Using the LLview client).